A worn notebook with the edges torn and a crisp, newly printed list of questions sat in the lap of one of the Cauldron’s staff members. With questions of the months-in-the making interview freshly inked on the newly printed sheet of paper, introductions were made between the two staff members of the Cauldron and the seventh president of Cleveland State University, Harlan Sands. Placed haphazardly in the middle of the table, which separated the president from the two interviewers, sat an iPhone opened on a digital recording app. With introductions drawing to a close, the recording button was hit and a 40-minute conversation about Sands’ presidency began. It all starts with the little things, a comparison that Sands quickly drew during the initial stages of the interview. An interesting comment, as most presidents usually have a vision of dealing with bigger issues, like grants and alumni contributions, from the start, rather than the little things. But Sands has decided to take a different approach to the matter, wanting to focus his attention to smaller changes. Emphasizing that these things, whether it be a stain on the carpet or fixing something broken in one of the classrooms, aren’t necessarily little to those having to deal with them on a day to day basis. “Little things matter. You can do the little things, and people know you’re paying attention,” Sands said. In order to bring attention to those smaller things, Sands created the One Thing campaign, where students can suggest “one thing” that the campus, and its leadership team, can do in order to make the campus better. For example, as some have noticed during the school year, the innerlink got a fresh update, thanks to Sands’ contribution to the campaign. While he’s focused on the “little things,” that doesn’t mean he hasn’t thought of the bigger picture when it comes to the betterment of Cleveland State as a whole. He’s got plans, and while he kept most of his thoughts on those forthcoming plans relatively general, it was enough to understand that Sands has not only decided how he wants to tackle the university’s most challenging issues, but how he’s seen doing it. 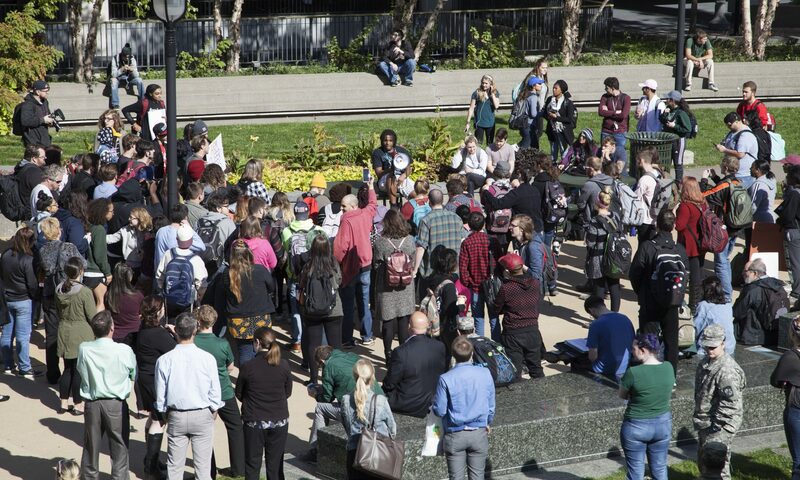 As most students have noticed during the course of the semester, Sands has been an outwardly open presence on the university’s grounds, something that is a stark contrast to his predecessor, Cleveland State’s sixth president, Ronald Berkman. “I don’t really know that much about Sands, but I have seen him around campus, unlike [with] Berkman,” Graciela Medina-Castillo, a sophomore in nursing, said. Most students and faculty who were at the university when Berkman was president can attest to the fact that he hid from the spotlight, whereas Sands has taken the spotlight in stride. The reasoning behind that, as Sands points out, could be for the simple fact that he sees himself as an important figure for the Cleveland State brand. At this point in his presidency, Sands sees his role at the university as its chief cheerleader and promoter. He likens himself to the university’s cheerleader, explaining that getting involved with the student population on campus and being a face that’s easily recognizable, has been a positive bonus to his newfound role. With a clear understanding of who he is to the university and an idea of the small issues students want to be taken care of, his first five months as president has also seen him trying to come up with solutions to some of the bigger problems on campus. Sands went on to explain that these bigger issues are something that will take a longer amount of time, and due to that, it takes a bit longer to either come up with solutions or fix the problem entirely. So, in order to help him manage the most pressing tasks, he has decided to think strategically in what his changes to the school will be. With this strategic planning in mind, there’s not one set thing he’s planning on focusing on so early in his presidency. But that doesn’t mean he’s not actively trying to figure out the things the university needs and the cuts that need to be made. It’s a process that takes some type of engagement on a number of varying levels. Whether it’s trustees, faculty and even the elected officials in the Student Government Association (SGA), there’s a need of representation on all fronts. By having that representation, the school is able to reach more people, and by extension, they can better understand the needs of the students. In addition to that, he says he wants to balance informal and formal processes when working with those groups. Utilizing informal ways of communication like posting to his social media or using formal processes like meeting students in a classroom, he’s found that he’s been able to connect with people by talking through these various means of communication, thus helping him determine needs. While it may seem like a lot, those things previously mentioned were something he tried to think about early on into his presidency. And, one of the first things he tried understanding was what made Cleveland State, Cleveland State. So, you may be asking, what makes that pie bigger? The retention and graduation rate at Cleveland State. As Sands explains, a student that doesn’t graduate can be seen as a “bad investment” for any university across the board. So, the school invests in ways to prevent those rates from lowering by investing in things like recruiting and teaching. With his first semester as the seventh president quickly coming to a close, it’s evident from the almost hour-long conversation that Sands has a lot to think about when it comes to the future of the university. A knock on the door interrupted the interview, meaning it was time for Sands to meet with his next appointment of the day. But before making an official goodbye, he offered to share a final thought. As Sands’ first semester as president is quickly coming to a close, students have been able to see him as the new face of the university. But what students don’t see, is what he is like outside of the campus. So far, Sands explained the that he and his family are still in the transitional stages of moving from their home in Philadelphia. As of right now, his family has opted to stay in their home so his oldest son, who is currently a high school senior, could finish out his high school career where he’s most comfortable. Following that, his family will then make the official move to Cleveland. While he’s away during most of the week, he values his time much more when he is back at home on the weekends. When asked about what he’s like as a dad, he explained that it’s difficult being away from his family, but it’s caused him to learn how important the little things are, an ironic comparison to his presidency style. Sands went on to say that the time he spends with his kids is important, so whether they go somewhere or just sit and talk about the latest video game they’re playing, that added time is important. Students and faculty are urged to email President Sands with their own suggestion on what should be changed on campus. President Sands can be emailed at President.Sands@csuohio.edu. The first One Thing suggestion that was implemented is the replacement of the Rhodes West sign, submitted by Nedra Haymon. Since then, grass has been planted outside the Music & Communication building, water fountains have been cleaned in the Health Sciences building, as well as many other One Thing suggestions. Previous PostPrevious Is Our Own Diversity Killing Us?